CRAWFORDSVILLE, Ind. 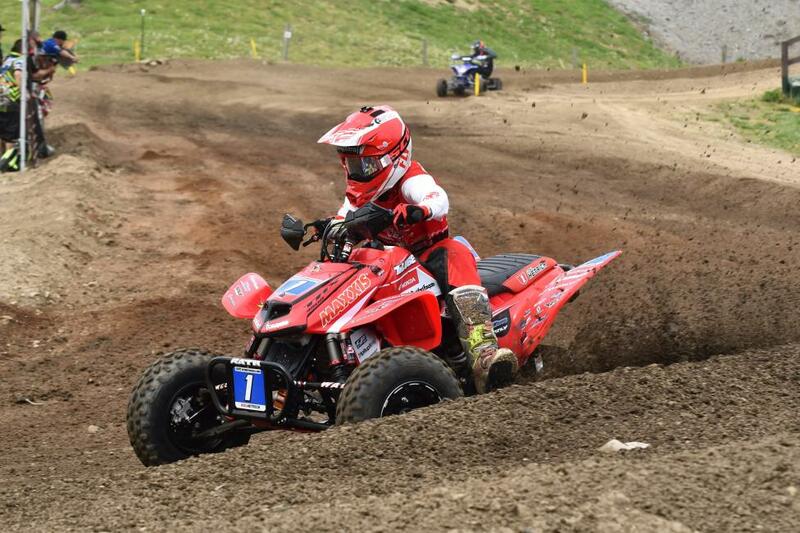 (May 7, 2018) – Round four of the 2018 ATV Motocross National Championship (ATVMX) Series, presented by CST Tires, an AMA National Championship, was greeted by partly cloudy conditions with seasonal temperatures as the first moto’s broke off the gate Saturday, May 5. 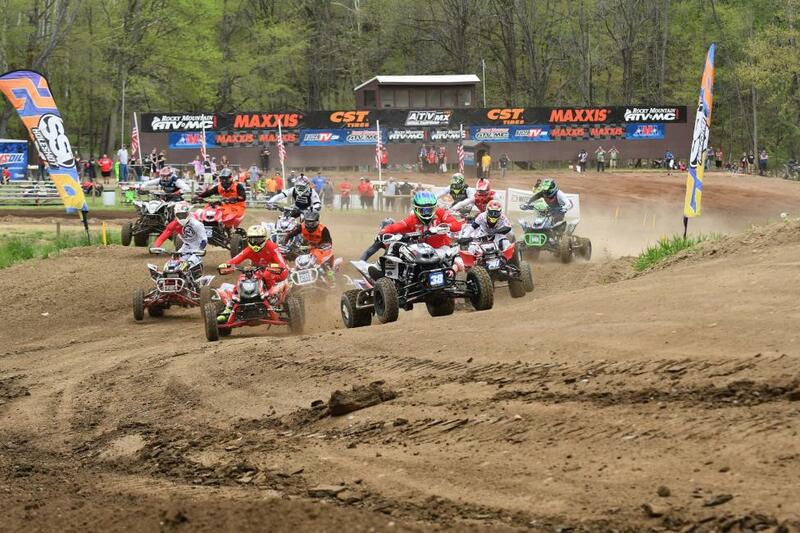 Ironman Raceway was in prime condition for the onslaught soon to be brought by the AMA Pro ATV riders. Kyler Lenz Motorsports Sam Rowe would clinch his first ATVMX Pro holeshot, however it would be Fosgate/Ti-Lube/Honda’s Joel Hetrick taking the win in moto one as he took the lead early and never looked back. The high-speed track was just what Hetrick needed to open up a commanding lead over the field of riders behind him. 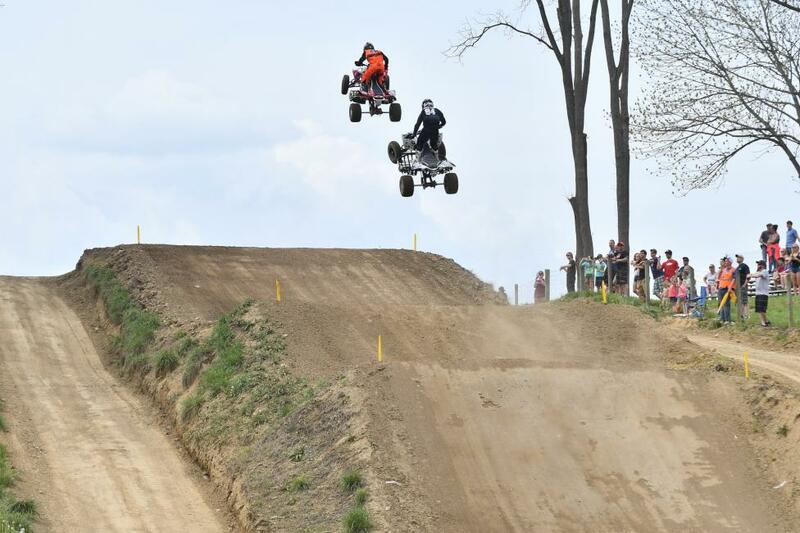 Hetrick tamed the big jumps with ease as he sent his Honda high into the Indiana sky to the cheers of his fans. Behind Hetrick was his closest competitor Wienen Motorsports/Yamaha/Maxxis’ Chad Wienen, who had started the moto mid-pack and had to work his way up to the front. A few mistakes would cost Wienen just enough time that afforded the hard charging Hetrick the lead he needed to take the checkers unchallenged. As the laps added up, Tbrown84 Training/CST Tires-backed rider Thomas Brown had secured the third spot as the checkered flag flew after a hard-fought battle with Baldwin/Jeff Rastrelli Land Grading/Ford Brothers Racing Honda’s Jeffrey Rastrelli. With a solid look at the track under their belt during the moto, the tension seemed to fade as moto two approached. The second moto looked to be another exciting race with everyone contesting for a good start, and the chance to face their demons that held back several of the top riders in the first moto. 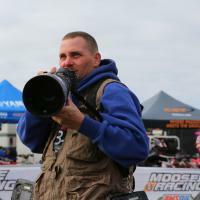 However, the second moto saw Hetrick off the gate and into the lead quickly as he was doing his best to have a repeat of the first moto performance. It did not take long before Hetrick had pulled a gap on the field and held a margin that would allow for small mistakes over a rough track. 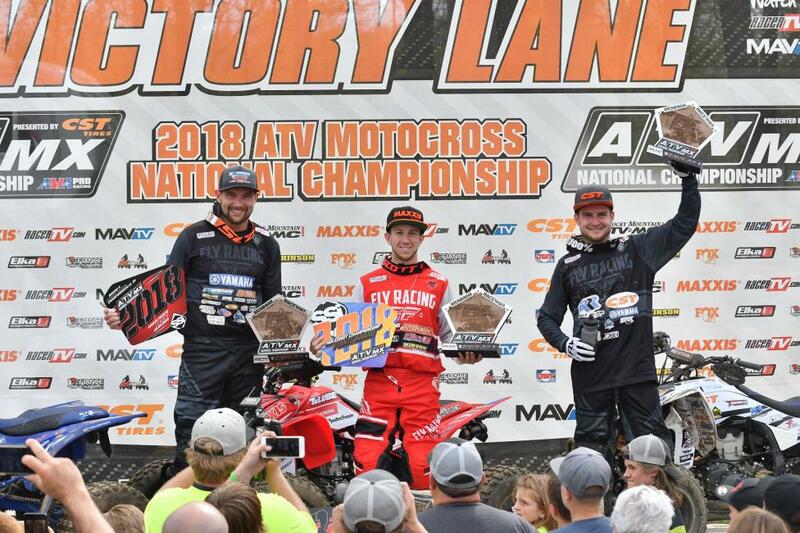 Mistakes seemed few as Hetrick earned the moto two win and the overall once again in Indiana. The running order seemed almost identical to the first as Thomas Brown and Jeffrey Rastrelli battled early before settling in to a solid pace that would last until the checkers flew giving Brown a podium visit, which he was desperately seeking as he claimed third behind Wienen, who would claim second overall. The post race podium was full of excitement as Hetrick relayed his point of view, which was sheer happiness in earning the win and leaving Ironman healthy and strong. For Wienen, the day wasn’t as successful as he had wanted but second would have to do after struggling with his moto’s and not being able to battle with Hetrick. Brown was elated to once again be on the box and will be pushing hard to keep his Yamaha on the podium. Jeffrey Rastrelli’s fourth place finish marked the first time this season he has failed to earn a spot on the box. This race was a tough one and he left it all on the track after battling lap-after-lap with Brown. The battle lines are being drawn as these two go after the same position, which should make for excellent bar-to-bar racing in the upcoming rounds. GennUSA Racing’s Nick Gennusa would be racing nearly healed from a practice crash just prior to round three. Nonetheless, Gennusa put in a solid effort today and leaves with the fifth spot overall and in the points standings. Sunday’s Pro Am racing saw some of the best battles we had seen all weekend long in Indiana. The first moto saw Ford Brothers Racing’s Cody Ford earn the win, but behind him Hinson/Walsh Race Craft/Honda’s Parker Wewerka and Dasa Racing/SSi Decals/Walsh Racing’s Troy Hill were battling it out for the second place position. 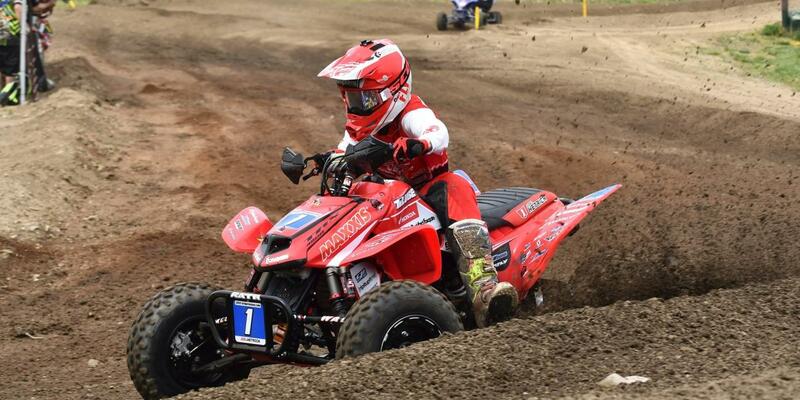 Wewerka would take second and Hill third in moto one. When moto two came around Sunday afternoon, Ford would once again lead the class as they came through the finish on lap one. However, Wewerka and Rockford Fosgate/Ti-Lube/Honda’s Haedyn Mickelson were on a mission and would soon make the pass on Ford for first and second. Mickelson was not done yet, as he battled with Wewerka and would take over the lead on lap three. As the checkered flag flew it would be Mickelson taking the moto two win, but with a moto score of 2-2, it was Wewerka with the overall. Mickelson would take second overall followed by Hill in third overall. 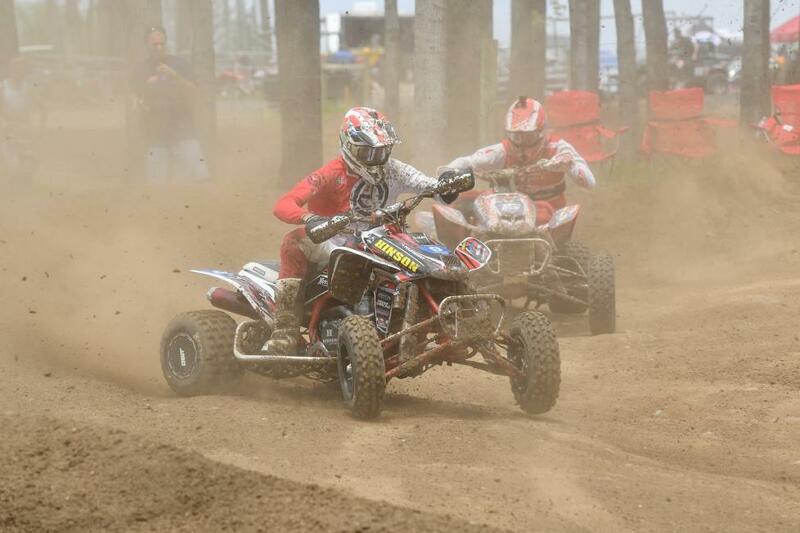 The series' next stop is round five at High Point Raceway in Mount Morris, Pennsylvania. It is another track that seems to favors Hetrick's riding style. The championship standings could swing as three points separate the top two, so be sure to look for some intense racing between the top riders as they battle or every point.